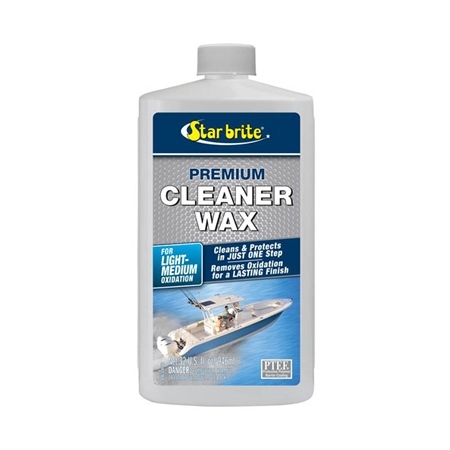 Home Page > Boat Care - Cleaners & Polish > Starbrite One Step Cleaner Wax 32oz. Unique formula cleans and restores fiberglass, metal and painted surfaces and leaves a protective coating, all in one step. Wipe on and buff off to remove oxidation, chalk and fading from dull fiberglass. Leaves a polymer coating with UV inhibitors to maintain restored surface. Perfect for older boats to restore shine and keep finish looking good. I didn't get around to cleaning my 2001 Ocqueteau 645 last year so it was covered in bird poo, fish blood and dried seaweed from my creels. I simply washed the boat with car shampoo and then used the Premium Cleaner wax. The roof, front deck and side-walks came up like new. I used the Starbrite hull cleaner on the hull and c**kpit and then applied the Premium cleaner wax. The hull has come up like new as has most of the deck. There are still a few blood spots which have solidified on the side walls, but I'm sure these will come off with a tad more effort. I would thoroughly recommend this product. Bought this to clean and wax my 40 year old Wayfarer, tried on transom and it's given it a completely new lease of life.